SuprSeal Severe Lost Circulation Material (LCM) is an excellent product for overcoming problems with vugs, fracs and those difficult lost circulation problems, and it’s manufactured right in the oil patch. *NOTE: WelDril does not recommend pumping SuprSeal through the bit nozzles. WelDril Products is renowned among those who work in the oil patch for its commitment to providing outstanding products and services to its customers. In keeping with that commitment, WelDril developed SuprSeal Severe Lost Circulation Material (LCM), a superior product to handle your severe lost circulation problems. SuprSeal LCM is an excellent product for overcoming problems with vugs, fracs and those difficult lost circulation problems, and it’s manufactured right in the oil patch. Lb./Gal Lb. Sack Sack Bbl. *No other solids are needed with this additive. Each sack of SuprSeal LCM contains 40 lbs. Example: 100 bbls of 8.7 lb./gal. 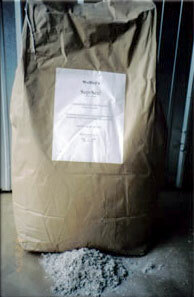 SuprSeal LCM slurry requires 125 sacks of SuprSeal and 91 bbls of water. Aggressive and thorough mixing is required. This bulletin reports accurate and reliable information to the best of our knowledge. WelDril assumes no obligation or liability for use of the information presented herein. Pull drill pipe and remove bit. Pull pipe safely above loss zone or into casing. Keep pipe moving if in open hole. Mix approximately 50-100 bbls of slurry and pump into hole. This product requires only water and a good mix. Pull into casing and fill hole through fill-up line. If hole does not fill, mix another slurry and repeat the above procedure. If hole stands full, close BOP and pump at a 2 bbl/min rate, until obtaining 300-500 psi holding pressure. If no holding pressure is obtained, wait two (2) hours and resume operations. Copyright © 2019, WelDril Products Company. All rights reserved.